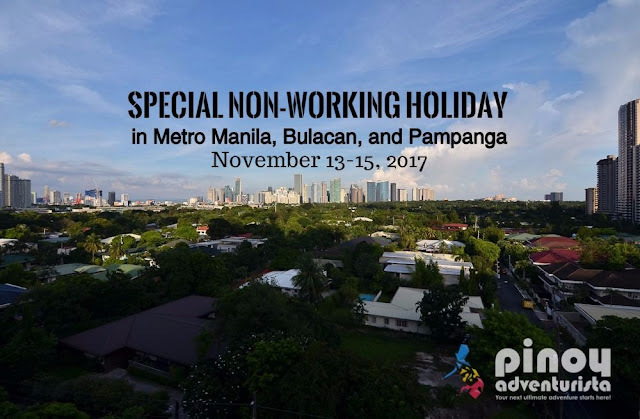 Special (non-working) holiday in Metro Manila, Bulacan, and Pampanga on November 13-15, and no classes from November 16-17, 2017 in Metro Manila. In a Facebook post by Presidential Security Group, it announced that "In line with the upcoming 31st ASEAN Summit on 12-15 November 2017, classes and work in Metro Manila are suspended on said dates." Is it confirmed or not? I tried to search the internet for the Proclamation of holidays on the said dates, but I can't find any. So, I guess, we still have to wait for the official proclamation if the said dates are really a holiday in Metro Manila. The post by Presidential Security Group Facebook Page has been deleted. PSG clarifies suspension of government work/suspension of classes in Metro Manila on November 12-15 due to ASEAN via Manila Bulletin. See below. Via CNN Philippines: "The Metro Manila Council (MMC) on Tuesday said that classes in all levels in Metro Manila public and private schools will be suspended on November 16 and 17 due to the 31st ASEAN Summit. The MMC added that an announcement on any suspension of work and classes from November 13 to 15 will be made by Malacañang Palace." Malacanang released Proclamation 332, s. 2017 declaring November 13-15, 2017 as a special (non-working) holiday in Metro Manila (National Capital Region), Province of Bulacan, and Province of Pampanga. Again, this is not yet confirmed. I will update this post as soon as a proclamation of class and work suspension on November 12-15, 2017 in Metro Manila is released by Malacanang Palace. Now, it's confirmed and official! This means that people who work or study in Metro Manila, Bulacan, and Pampanga will have an extra 3 days off at work and in school from November 13-15, 2017 and will have a long weekend starting from November 11 to November 15, 2017. Meanwhile, students studying in Metro Manila will have additional 2 days of no classes in November 16-17, 2017. It's time to plan your much-deserved vacation!